Backpack: How do I choose who can see my Calendar? By default, every Backpack user has a calendar which is private and hidden from the other users who share your account. 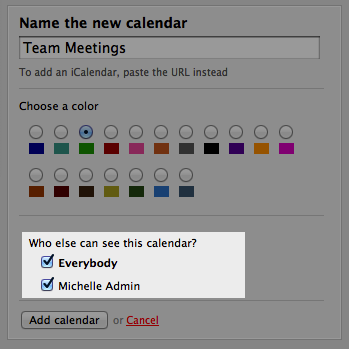 You can choose to make a calendar visible to everyone else in your account, or visible to specific users. If a user can see your events, they are also able to edit those events. When you add a new calendar (or edit an existing one), you can choose who on your account can view it by checking/unchecking the boxes next to their name.